Primary intraosseous or ectopic meningioma of the skull is a rare tumor accounting for about 1% of meningiomas. Intradiploic meningioma is an extremely rare type of extraneuraxial meningioma. It is postulated to arise from arachnoid cell rests captured at inappropriate sites during embryonic development or implantation of these cells by some mechanical insult like trauma or dural tear. Their origin can also be attributed to cellular dedifferentiation within the diploic space or cranial nerve sheath cells during their course through dipoles. These arise in paranasal sinuses, neck, and orbit and very rarely in diploe of cranial bones. Pediatric orbital roof intradiploic meningioma is reported in the isolated case reports. ,,,, These tumors are observed mostly within the first two decades of life and histologically are usually of psammomatous variety. Here the authors present a case of a 16-year-old female who had progressive proptosis with intact vision and was managed successfully surgically. This patient presented to our Out-Door Department with complaints of progressive proptosis of the right eye for the last 2 years with associated occasional mild to moderate headache. There was neither associated history of diminution of vision on the affected side nor diplopia in any of the gaze. On examination, there was axial proptosis on right side without any restriction of the extraocular movements. Visual acuity as per Snellen's chart was 6/6 in bilateral eyes with normal visual fields and fundus examination. Rest of the neurological examination was normal. Hematological and biochemical parameters were normal. Computerized axial tomography (CT) scan with thin cuts of the orbit suggested a hyperdense lesion of about 4 cm × 5 cm size at the orbital roof causing splaying of the outer and inner tables with extension into the superior and supero-lateral aspects of right orbit displacing the globe antero-medially and enlargement of the right orbit [Figure 1]. The lesion extended up to the olfactory groove medially and planum sphenoidale posteriorly. It also encroached upon the ethmoidal, sphenoid and frontal sinuses but without any bony destruction. There was slight hyperostosis of the anterior and lateral part of the orbital roof. The lesion enhanced homogenously intense after contrast administration [Figure 2]. Magnetic resonance imaging (MRI) showed T1-weighted iso-hypointense and T2-weighted heterogeneous mass lesion in the right orbital roof with intense postgadolinium enhancement [Figure 3]. Routine presurgical work-up was done, and the patient was electively taken up for microsurgical excision under general anesthesia. Right fronto-temporal craniotomy with orbitotomy done to expose the tumor. Tumor was found to be completely extra-axial destroying the orbital roof and extending into the basifrontal region and into the sphenoid sinus. Tumor was soft, suckable, pinkish in color and highly vascular. Gross total microsurgical excision including the attached dura mater done. Duraplasty was done using the pericranium graft. Orbital roof was reconstructed using split calvarial bone graft to avoid any postoperative pulsatile proptosis. Bone flap fixed in an esthetic manner and closure done in layers. Lumbar drain was placed to prevent any cerebrospinal fluid (CSF) leak from the basifrontal dura and consequent CSF rhinorrhoea. Postoperative course was uneventful. Patient is preserved neurologically with excellent cosmetic outcome. Intradiploic meningioma is very rare in children and reported in isolated case reports. In 2011, Khalatbari et al. could find only seven cases of intradiploic meningioma of the orbital roof published in the western literature and added their one own case in a 14-year-old female. Various hypotheses are postulated to explain its extradural origin. One postulate is that intradiploic meningioma originates from entrapment of arachnoid cells within the bone. Multiple theories exist on how the cells become located in the skull; although none are universally accepted, and different origins are possible. Head trauma, abnormal cranial moldings and embryogenesis, and arachnoid cells accompanying blood vessels and cranial nerves as they traverse the skull, can all result in the entrapment of arachnoid cells or meningocytes in the bone. It is presumed that intradiploic meningioma arise from these entrapped cell rests in the calvarium. Clinically these case present with exophthalmos, on the involved side, tends to occur predominantly in early second decade of life. However, vision is usually unaffected and in addition they can have a subcutaneous mass. Radiographically, X-ray can delineate location and its chronic pressure effect on surrounding bone. ,,,,,,, It shows generally osteoplastic or hyperostosis reaction in the form of granular or speckled calcification which involves roof or wall of the orbit. Radiologically intradiploic meningiomas are typically either osteoplastic or osteolytic, however, mixed versions also have been reported although the majority are osteoblastic, extremely rarely are osteolytic or very extremely have a mixed pattern. These can present with opacity of the orbital roof on X-ray skull study. Osteoblastic variety causes hyperostosis, which may mimic fibrous dysplasia. Most of these tumors are benign but malignant transformation is also described. The osteolytic subtype of intradiploic meningiomas are more likely to be malignant than the osteoblastic subtype. Intradiploic meningiomas should be considered in the differential diagnosis of patients presenting with osteoblastic or osteolytic skull lesions. The osteolytic lesions typically cause thinning, expansion, and interruption of the inner or outer tables of the skull and these lesions also enhance homogeneously after contrast administration. However, CT imaging can reveal osteoplastic, intradiploic placement of meningioma, MRI can show better delineation of extension of meningioma and soft tissue involvement. The osteoblastic variety causes hyperostosis, which may mimic fibrous dysplasia and solitary osteoma. However, clinically intradiploic orbital roof meningioma presents with proptosis, but intraorbital meningioma presents with proptosis and decline in visual acuity to almost complete vision loss. However, CT scan and MRI will clearly delineate even intraorbital meningioma. Rarely rapidly progressing chondrosarcoma, can sometimes occur in orbital wall, is known for aggressive behavior with a high recurrence rate and causes distant metastasis. Hence, preferably orbital chondrosarcoma should be excised along with an eye ball and the orbital contents to prevent recurrence in future. In the present case, the lesion appeared as an osteolytic variety, with an interruption of the outer table as well as an intact inner table with extensions as described earlier. Surgery is usually the standard mode of treatment, and all reported pediatric cases had surgical excision, and no recurrence is reported in pediatric cases. However, meticulous reconstruction of the orbital roof is essential and can be done using calvarial bone graft or titanium plate. In the present case, we achieved complete microsurgical excision of the lesion with reconstruction with split calvarial bone graft with excellent neurological and cosmetic results without any postoperative complications. Intradiploic meningiomas are extremely rare lesions and usually do not cause dural infiltration, so extradural complete surgical excision is preferred, and intradural exploration is usually not required. However, intradural exploration is advised only if there is extensive dural infiltration or dural breach is observed. Excellent results can be obtained with proper surgical planning and meticulous surgical technique. 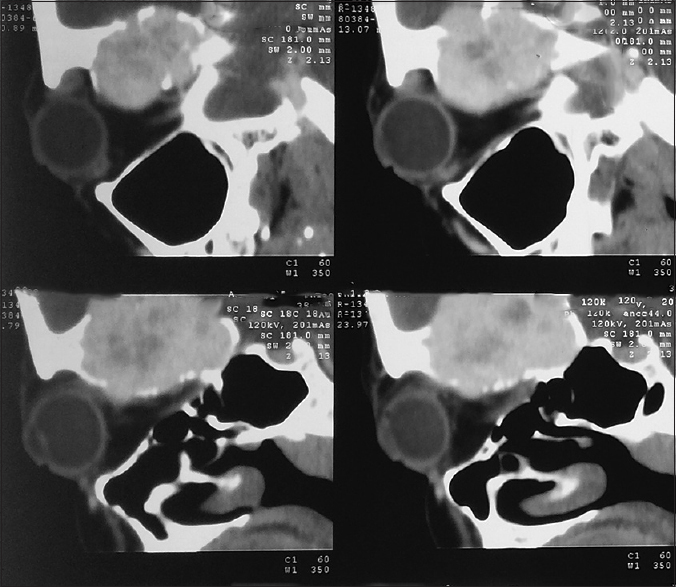 Khalatbari MR, Borghei-Razavi H, Moharamzad Y. Intradiploic orbital roof meningioma with pneumosinus dilatans in a child: A case report and review of the literature. Pediatr Neurosurg 2011;47:66-71. Kobayashi S, Kyoshima K, Nakagawa F, Sugita K, Maruyama Y. Diploic meningioma of the orbital roof. Surg Neurol 1980;13:277-81. Halpin SF, Britton J, Wilkins P, Uttley D. Intradiploic meningiomas. A radiological study of two cases confirmed histologically. Neuroradiology 1991;33:247-50. Cirak B, Guven MB, Ugras S, Kutluhan A, Unal O. Fronto-orbitonasal intradiploic meningioma in a child. Pediatr Neurosurg 2000;32:48-51. Desai KI, Nadkarni TD, Bhayani RD, Goel A. Intradiploic meningioma of the orbit: A case report. Neurol India 2004;52:380-2. 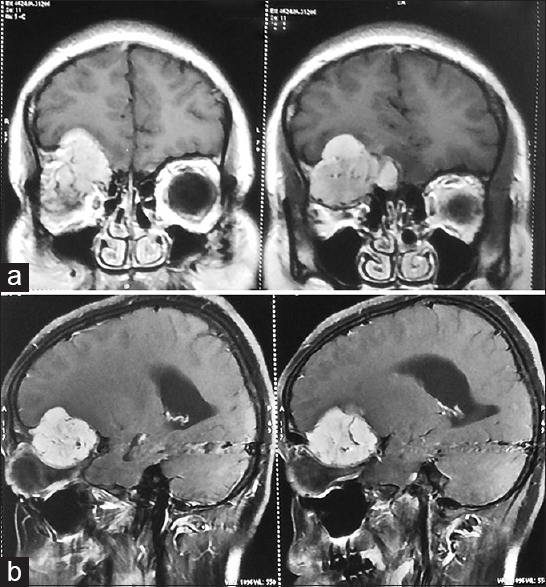 Shibata Y, Osuka S, Matsumura A Intradiploic Meningioma in the Lateral Orbital Wall: A Case Report. J Cancer Ther Res 2012;1:16. Pompili A, Caroli F, Cattani F, Iachetti M. Intradiploic meningioma of the orbital roof. Neurosurgery 1983;12:565-8. Lang FF, Macdonald OK, Fuller GN, DeMonte F: Primary extradural meningiomas: a report on nine cases and review of the literature from the era of computerized tomography scanning. J Neurosurg 2000; 93:940-50. Borkar SA, Tripathi AK, Satyarthee GD, Rishi A, Kale SS, Sharma BS. Fronto-orbital intradiploic transitional meningioma. Neurol India 2008;56:205-6. Sambasivan M, Sanal KP, Mahesh S. Primary intradiploic meningioma in the pediatric age-group. J Pediatr Neurosci 2010;5:76-8.